Our Replenishing Day Moisturizer is an intensive crème that absorbs deep into your skin tissue. 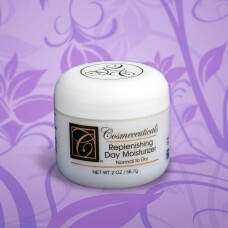 This ultra-rich crème is contains special botanicals with Silk Amino Acids to give your skin strength and flexibility. Formulated to absorb quickly and give strength, resulting in silky – smooth - hydrated skin. Method of use: Apply liberally, with fingertips, in an upward motion to face and throat area after cleanser and toner applications. For protection and hydration of the skin, apply each morning. Suggestion: Apply AccuFirm Serum™ and Firm-A-Gan™ before Replenishing Day Moisture TM for additional lift and firming to the skin.